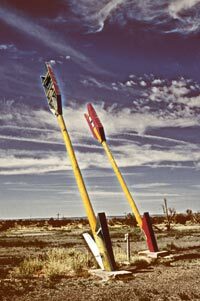 Once a popular Route 66 trading post, café and truck stop, Twin Arrows is casualty of the Interstate. Today the land is State Trust property and its famous arrows are slowly being worn away by the elements. Color filter used for effect. Limited edition. ©2005-2010 Lorissa J Longfellow. All rights reserved.